High quality POW/MIA rayon flag mounted to a black dowel with a gold spear tip. All our POW/MIA Flags are proudly made in the USA. The 4x6" POW/MIA stick flag is mounted to a 10" dowel. 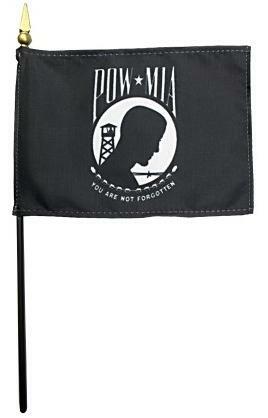 The 8x12" POW/MIA stick flag is mounted to a 18" dowel.